Glamorgan's Michael Hogan (right) looks on after his ball hits Hampshire's Jimmy Adams (left). 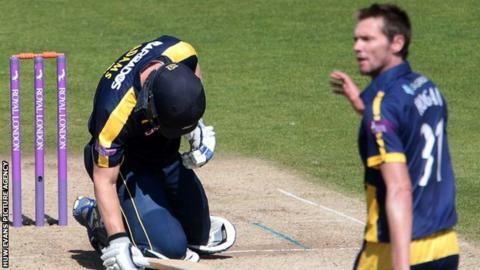 Glamorgan have been fined £9,000 - of which £5,000 is suspended - and docked two points for the "unfit" pitch against Hampshire in the One-Day Cup. An England and Wales Cricket Board Disciplinary Panel also awarded two points to Hampshire after the game in Cardiff on 2 August was abandoned. The umpires called off the game after two Hampshire batsmen had been hit by rising deliveries. Glamorgan have also been given a suspended two-point deduction. That punishment, together with the suspended fine, will be implemented only if any Glamorgan pitch is rated unfit next season. The Welsh county had started this season's One-Day Cup competition will a two-point deduction for a poor pitch against Durham last season. Of the £9,000 fine, £4,000 will be handed over by the ECB to Hampshire to provide compensation to their travelling supporters. Glamorgan pleaded guilty to the charge at Monday's hearing and are conducting their own investigation into the circumstances that led to the pitch being unfit for play. "Our internal investigation is ongoing and we are committed to taking whatever action is necessary to ensure that we produce the best possible pitches for the rest of this season and beyond," said Glamorgan chief executive Hugh Morris. "We will provide a further update when we are in a position to draw firm conclusions." Glamorgan's Swalec Stadium hosted the opening Ashes Test this summer. The pitch faced initial criticism, but was subsequently defended following England's 169-run victory. The stadium will host two T20 internationals on 31 August, with England Women facing Australia at 10:30 BST before the men follow at 15:00 BST. Glamorgan have refused to confirm whether head groundsman Keith Exton will continue to be responsible for preparing the pitches. Exton was appointed by Glamorgan in 2008, seven months before the Swalec Stadium staged the opening Test of the 2009 Ashes series. The match with Hampshire was called off after batsman Jimmy Adams and Michael Carberry had been struck by balls that rose sharply off the pitch. The visitors had reached 26 without loss from 6.4 overs in reply to Glamorgan's 182-9 from their 50 overs. Glamorgan's two-point deduction means they drop to eighth in the table with just two points from six games. Hampshire remain third, but are now on eight points, three points behind Group B leaders Nottinghamshire.